This post is actually going to be about a "few of my favorite things" (I've always wondered why that song was sung around Christmas, but I'm not going to question it, and instead, I'll just use it in my posting). 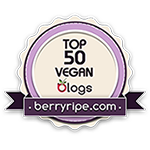 I usually post when something really catches my eye, but this time, I'm going to give you my Top __ List of vegan paradises. Of course, they will all be in the Northwest, because that's where I live, but I'm sure there are cool places elsewhere. I just haven't been to them. This is not in any order but the order in which I thought of them. Enjoy!